One of the enticements of cemetery hopping is discovering the ones I’ve never seen before. Especially those off the beaten path. I recently purchased a copy of Cemetery Records of Tucker, Georgia and Environs by Ted O. Brooke. As I thumbed through it, I found some smaller cemeteries I’d never even heard of before. My photographer friend, Jennifer (who wrote a guest post a while ago), also loves these hidden gems. We finally found time to venture out together to see some of them. She’d already seen most of them but like me, enjoys revisiting certain cemeteries over and over. 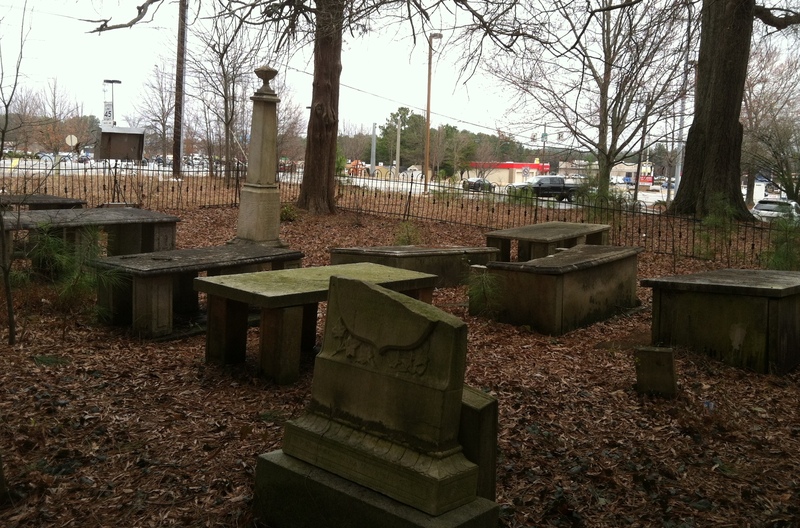 Nesbit Family Cemetery sits on the edge of the Gwinnett County line near the busy intersection of Lawrenceville Highway and Jimmy Carter Boulevard. I must have passed by it several times (like many people) without even seeing it. 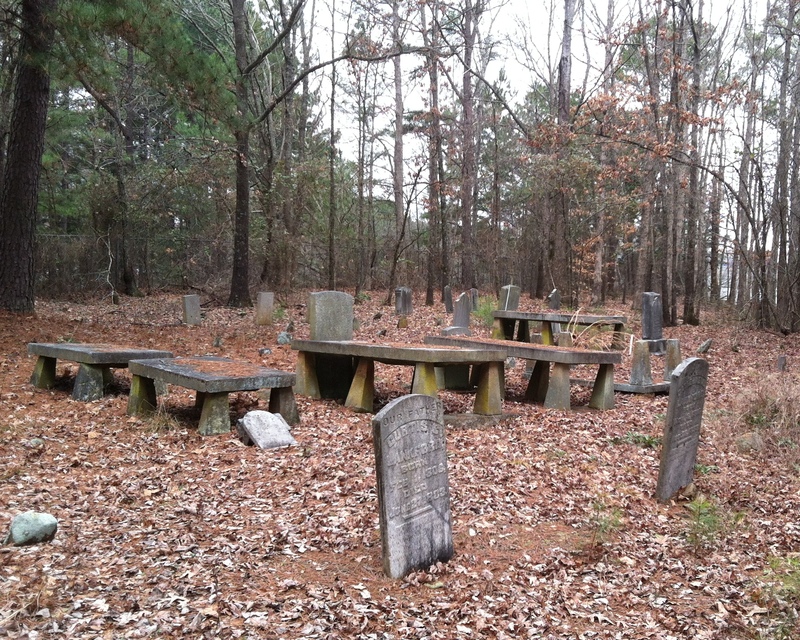 Located in the woods beside a Georgia Power building, Nesbit Cemetery is a collection of almost 20 graves surrounded by a low metal fence. 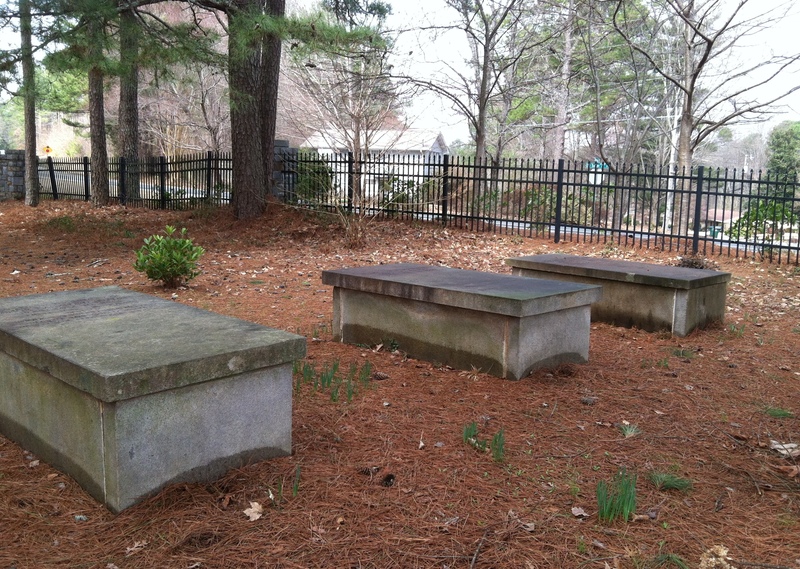 There are a mix of grave styles, from the table variety to the box type. Although many of the tombstones are broken or off of their bases, it looks like someone is looking after the place. 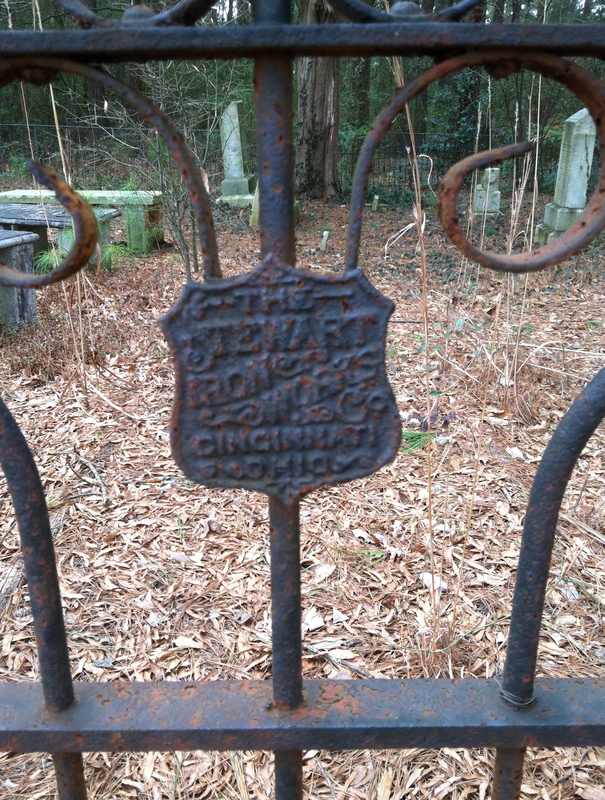 This iron gate is the entrance to Nesbit Family Cemetery. It’s worn around the edges but worth seeing. The contrast of this quiet little cemetery with the frenetic energy on the road behind it is remarkable. Few know it’s there. William Nesbit’s grave is the oldest (1789-1863) and he has quite a history. A native of South Carolina, Nesbit fought in the war of 1812 and was one of the founding settlers of Gwinnett County. He was its first elected sheriff. Nesbit also served Gwinnett County in the Georgia State Senate for two sessions, first in 1829 and later in 1833. His 650-acre plantation was located near the Gwinnett/DeKalb County line. He and his wife, Mary Lawless Nesbit, had 12 children together. Some are buried near him. 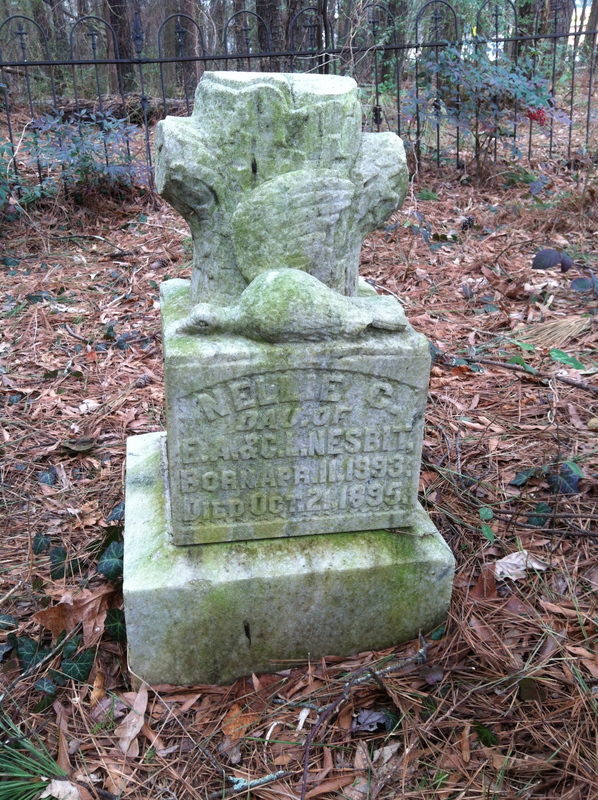 Little Nellie Nesbit only lived for two years but her tombstone still speaks today. Alvin Craig Nesbit’s grave is broken but still beautiful with the clasped hands motif. He was one of William Nesbit’s 12 children. It’s hard to believe anyone would know that Pounds Cemetery is located in an industrial park but someone is taking care of it. Our next stop was a cemetery neither one of us had visited before. 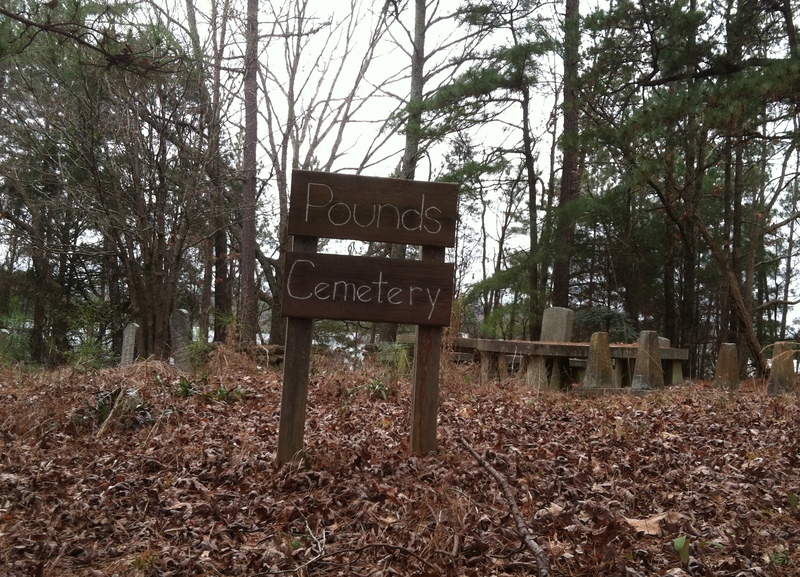 Pounds Cemetery is located down a pine-straw covered drive deep inside an industrial park off Mountain Industrial Boulevard. While only about 25 graves are marked, there are many more unmarked simple fieldstones scattered about to indicate others are buried there. I don’t know anything about this particular cemetery. Members of the Pounds, Lankford, and Thompson families are represented. But the most stunning of the graves are the trio of unmarked cairn-style graves. Two are in rather sad shape but the third is in better condition. I am guessing because of the proximity of these two graves that it was a married couple. Their names are unknown. 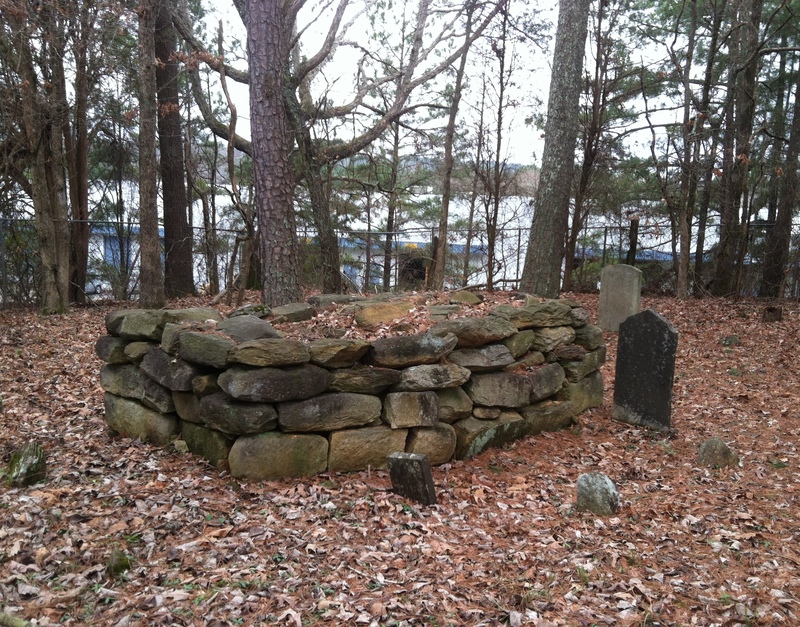 The identity of the person buried in this cairn grave is also unknown. The rest of the cemetery is a collection of fieldstones, table-style graves and upright tombstones. You can clearly see warehouses surrounding it. However, it’s not that difficult to picture what it might have been like a hundred years ago before most of the forest around it was cut down. The fieldstones scattered about the marked graves tells me there are many more people buried here than meets the eye. Remember my writing about risking life and limb when I visited Old Greencastle Cemetery in Dayton, Ohio? When we went to Double Springs Church Cemetery in a Smokerise neighborhood, not far from Stone Mountain, it felt like deja vu. 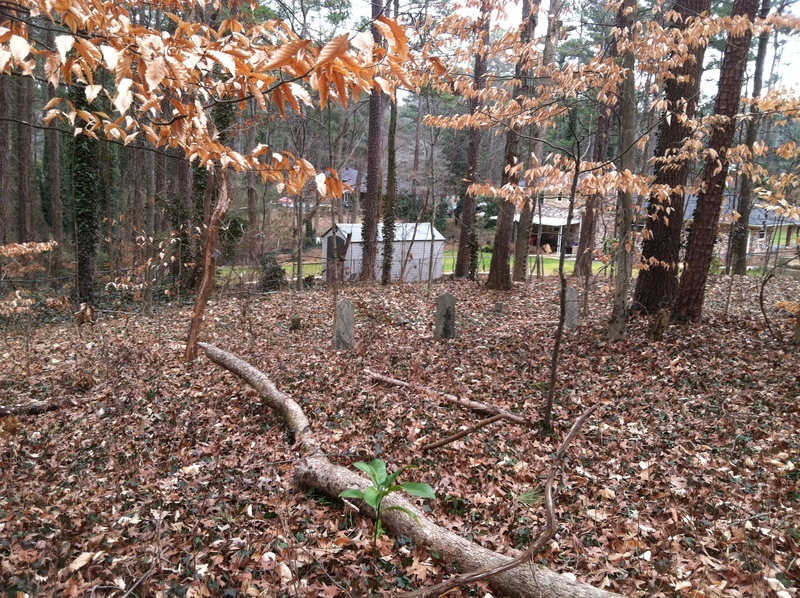 This small cemetery is located behind two houses. Fortunately, there is a public easement between the two that enables visitors to see it without having to ask permission. I am sure most people haven’t due to the uneven terrain and difficulty in keeping one’s footing. Driving down the neighborhood street, you’d never know there was a cemetery behind this house. Atlanta’s foremost cemetery hopper, Franklin Garrett, surveyed this cemetery in 1932. His books are invaluable to researchers. In his survey, he noted that a non-denominational church adjoined the cemetery once, but had been torn down many years before. 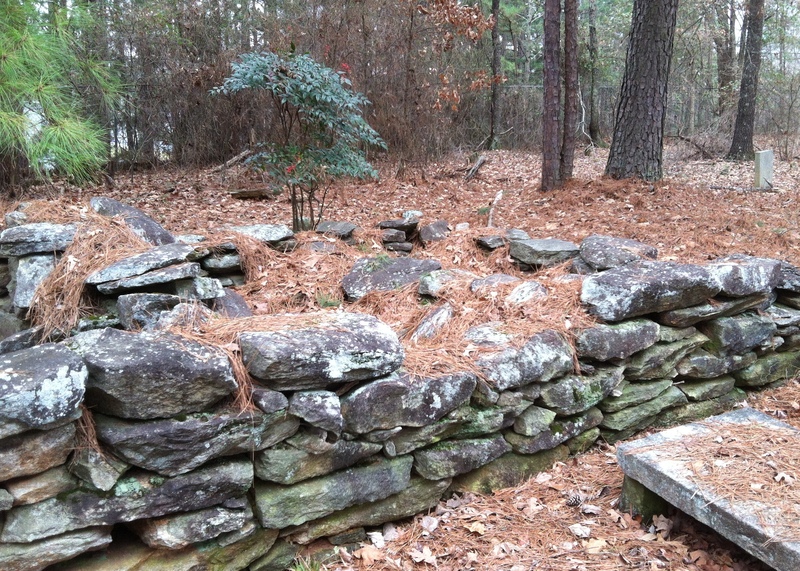 Only nine marked graves seem to have survived and they are almost all from the Seay family. A number of unmarked stones are scattered about. Most were hidden under the leaves the day we visited. Jennifer knows more about the Seays than I do so I’ll have to pick her brain for more details. Samantha Seay almost made it to the ripe age of 70. 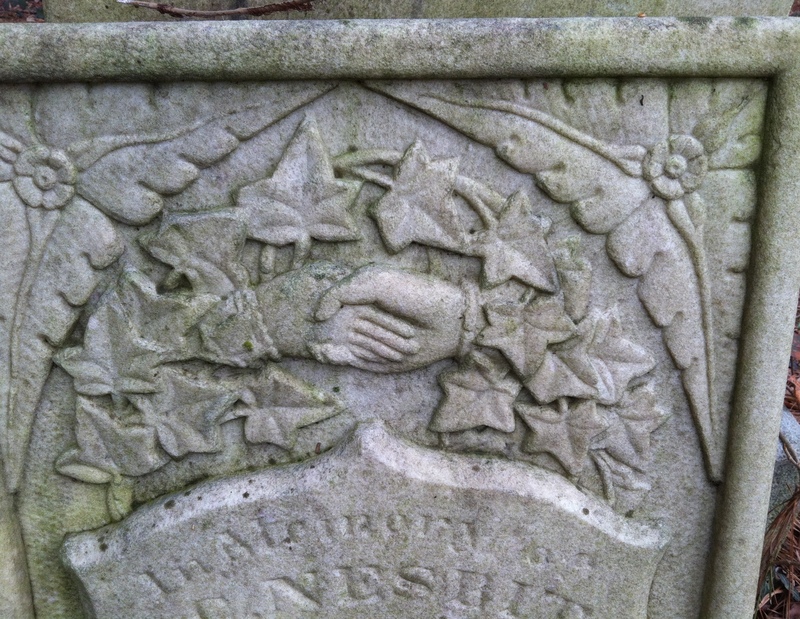 The broken flower motif on her tombstone is touching. This might give you an idea of the condition the cemetery is in and how difficult it was to walk around in. Our last stop was just down the road at Braden Family Cemetery. It consists of only four marked graves. However, unlike Double Springs Cemetery, this one is on the edge of a very upscale neighborhood and is well tended. Three box graves contain a mother and two sons. 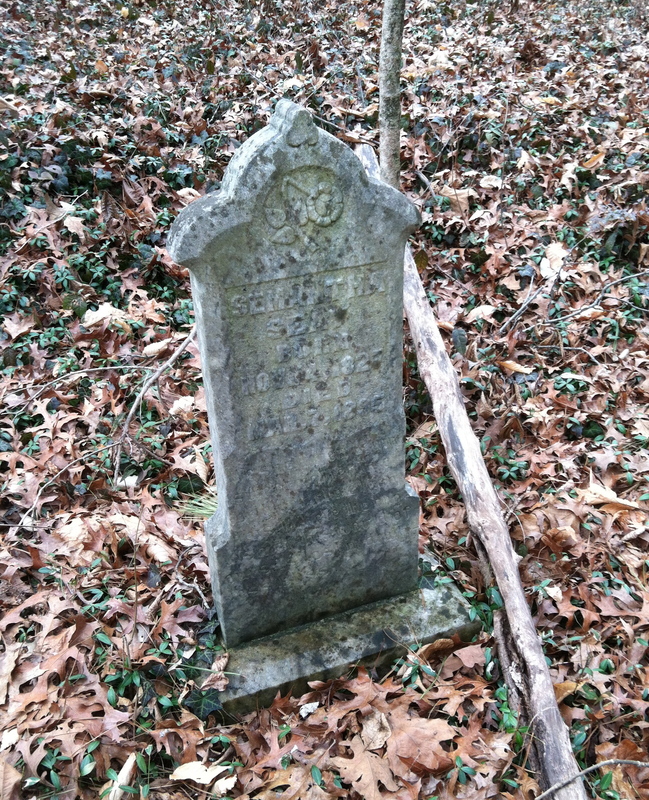 Robert Mansfield Braden, was the husband and father but his grave has not been found. Four members of the Braden family are buried here. Mother Rhoda is buried between her sons, Minor and Rufus. On the far left end is a monument to Minor’s wife, Mary Jane Milligan Braden. The whereabouts of Robert Mansfield Braden’s grave, the husband of Rhoda and father of the Braden sons, is unknown. Rhoda was born a Lankford, many of whom are buried over in Pounds Cemetery. 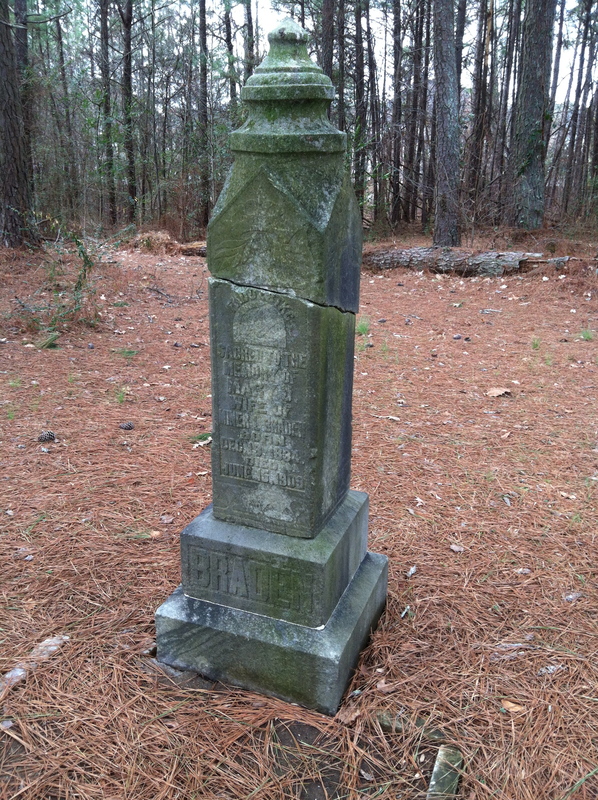 The monument for Mary Jane Milligan Braden is damaged but has been repaired. By the end of our tour, I’d seen parts of Tucker I’d never seen before. But it made me eager to find more of these hidden gems tucked away in the neighborhoods around me. To glimpse the forgotten history of the place I now call home. Because you never know what’s waiting in your own backyard. I’ve never seen those table-style stones before – awesome! It’s so fun to search out little hidden gems like these. I know! I hadn’t seen any of them before either. Very cool to see. 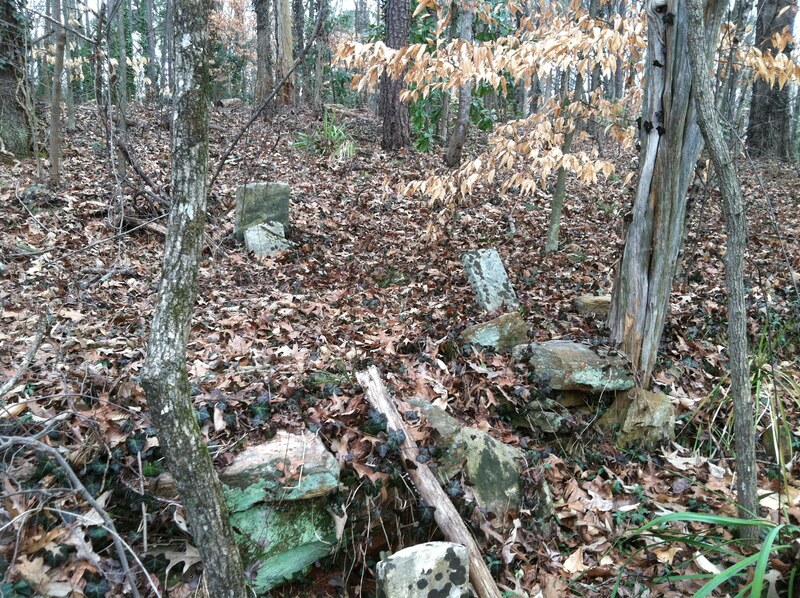 Do you know where off of Mountain Industrial Boulevard the Pounds Cemetery is located? I am a member of the Pounds family and would love to visit it if possible. The best address I can give you is just after Dixie Industrial Finishing, which is at 4925 S. Royal Atlanta Drive, on the right. There is no sign on the road. Only some woods with a chain across an old road. We passed it twice before we figured it out. Just pull off the road and walk back, you will find it. This was not private property at the time we visited so you should be fine. Hope this helps!